This only needs a few ingredients to make, and the nice thing is that you control what goes into it. 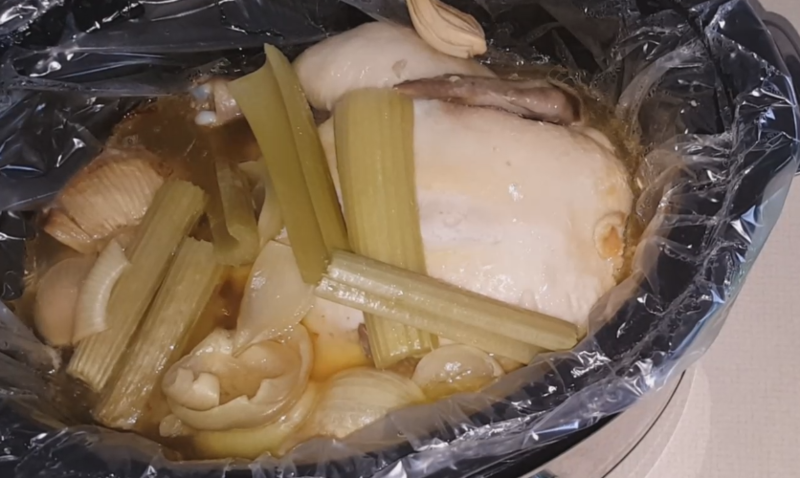 Basically just need a crock pot, crock pot liner, a whole chicken, onion if you want and maybe either celery or some other vegetable (such as carrots). 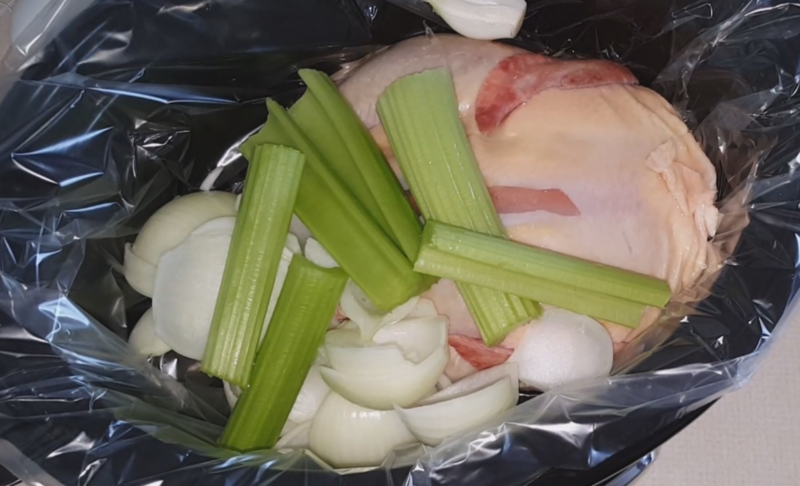 All that you need to do is take the whole chicken and place it into the crock pot, add the amount of vegetables that you want to add to it (for flavoring), then cook it on low for 10 hours, then save the juices left over. Those can be bagged and sealed and placed in your freezer. cook the Whole chicken on low for 8 - 10 hours. Remove the crock pot liner with the chicken stock / broth inside of it. Place in your fridge overnight to allow the fat to solidify. Remove the fat (if you want) and then place in bags to seal. See my video below on how this is done. This entry was posted on March 25, 2017 at 12:18 PM and has received 461 views. There are currently 0 comments. Print this entry. If you watch out what you put into the crockpot,you can easily use it. We used to use packets of french onion soup mix, but no longer do that. 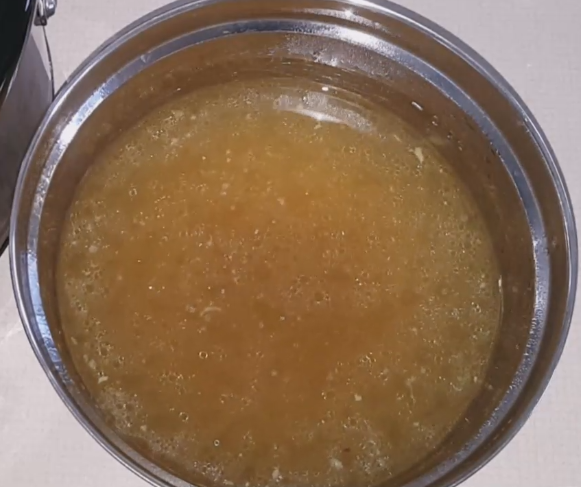 One of the main reasons we dont is that it is not gluten free, and the other is that it will give the beef broth a flavor of french onion soup, to which we do not want that in the stock. Basically just need a crock pot, crock pot liner, beef roast, onion if you want and maybe either celery or some other vegetable (such as carrots). All that you need to do is take the beef roast and place it into the crock pot, add the amount of vegetables that you want to add to it (for flavoring), then cook it on low for 10 hours, then save the juices left over. Those can be bagged and sealed and placed in your freezer. cook the beef roast on low for 8 - 10 hours. Once the beef roast is done, remove the roast. 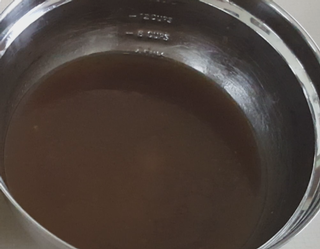 Remove the crock pot liner with the beef broth inside of it. This entry was posted on March 24, 2017 at 1:25 PM and has received 417 views. There are currently 0 comments. Print this entry. Here is a recipe for a basic, low carb,gluten free, keto friendly cheesecake. This is a no-thrills cheesecake, not much to it and simple to make. You can modify this to have the different flavorings in it if you want such as chocolate, fruit, seasonings, etc.. In a bowl, add the cream cheese and cream them using a handheld mixer or a kitchenaid mixer until it has a nice creamy consitency. add the Splenda, sucralose, stevia or Erythritol , vanilla extract and continue to mix for a few more minutes. Add one egg at a time and mix for about a minute after adding each egg. Pour into the greased pie plate. bake for about 45 - 50 minutes. Let it cool and serve. Add toppings if you do not like the taste of plain cheesecake. This entry was posted on February 28, 2017 at 10:06 AM and has received 642 views. There are currently 0 comments. Print this entry. In my quest to find a replacement for the Ham and Egg bake that my family loves to have for breakfast in the AM, i decidedto take out the high carb ingredient (potatoes) and replace it with a low carb alternative (cauliflower). This needed to cook longer than a traditional egg bake does, possibly due to the extra water in the cauliflower, but it still turned out to be good. I did not put any "seasoning" on this, but some ground pepper seemed to compliment this fairly well. If ham is not your thing, you can certainly replace the ham with another protein source, or you can leave it out all together. I have used turkey ham from time to time when is on sale and cheaper than the regular ham product. about 2 cups of shredded cheese. Cook in the oven for about 10 - 20 minutes to soften up the cauliflower. While the cauliflower is cooking, in a medium bowl add the eggs and the heavy whipping cream (can also use almond milk) and mix together using a immersion blender or a handheld blender. Chop the ham or turkey ham into bit size pices. add the ham and 1/2 the cheese into the cauliflower and mix well. Cover with aluminum foil and bake for 30 - 45 minutes. Remove the aluminum foil and bake for an additonal 45 minutes. Check the casserole at the end of the 45 minutes to make sure that all the eggs are cooked. If they are not fully cooked, cook for an additional 20 - 30 minutes. Check the eggs about every 15 minutes to see if the eggs are done or not. This entry was posted on February 28, 2017 at 8:06 AM and has received 624 views. There are currently 0 comments. Print this entry. 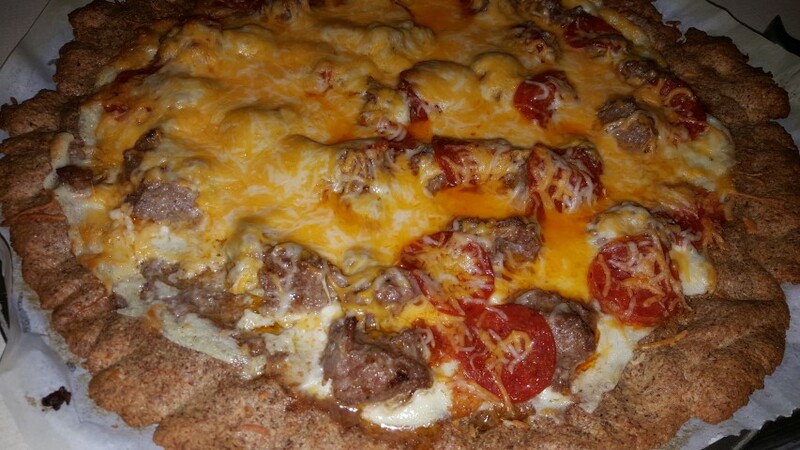 Making pizza crusts that are not only gluten free, but also keto friendly (low carb) can be tricky sometimes but once you find what works,you can tinker here and there to find different variations that definatly work. The almond flour crusts are no exception here as I have about 3 or 4 different variations of the almond flour crust and I have about 7 or 8 different pizza crusts that fit both diets. This latest one is one that the whole family for sure likes, and it like the rest will be one that is only requested once in a while once people get too much of it, but to have as many pizza crusts as I do for sure help. This is one of the crusts that you will want to par bake first, and you will for sure want to bake it onto a sheet of parchment paper on your pizza pan to prevent it from sticking. Melt the cheese in a bowl for about 60 - 90 seconds. Using a handheld mixer mix up the ingredients until it starts to resemble dough. Once the dough is in the shape that you want it to be in, remove the clear plastic wrap and bake it in the oven for 15 to 20 minutes or so. Use your favorite pizza sauce and make your pizza. My favorite sauce is ranch dressing. This entry was posted on February 26, 2017 at 10:50 PM and has received 496 views. There are currently 0 comments. Print this entry. The image above does not do this justice, mainly because I am horrible at frosting things. The frosting department is usually done by my wife, as she will usually take over since I am so horrible at it. I just cannot seem to get this down no mater how hard I try to do at it. This is a very simple cake that uses the principles from the 90 second bread, and the 90 second strawberry short cake recipes to make a individual cake. This works in a pinch, just like the other ones do and this one can be made just for you if you go to a party that has cake at and you dont want to be left out. The super nice thing about this, is that you can make this at work! All you need to do is bring some frosting with you, and the ingredients and you can actually bring this along and mae it in your break room at work! frosting, how ever much you want to make and or use. After it has cooled, frost it with the frosting and enjoy. This entry was posted on February 26, 2017 at 10:04 PM and has received 768 views. There are currently 0 comments. Print this entry. One thing that I miss about doing gluten free, and low carb at the same time is Ice Cream Sandwiches. Here is a fairly good base for a ice cream sandwich that definatly works, especially if you make your own ice cream. If you need a recipe for a ice cream, I do have a recipe on how to make your own Keto Friendly, Low Carb, Gluten Free Ice Cream. If you have your own Ice Cream made up, or you bougt some, the sandwiches here only take 90 seconds as we are using the base for the 90 second bread, to which we modified to make the strawberry shortcakes. This recipe is fairly simple and the nice thing is that you can easily add more cooa powder, remove cooca powder if it is too much for you. You can also add more Erythritol if you want, or you can add more vanilla extract. You could even make the sandwiches and put low carb whipped cream in between and freeze that for a while. Cut in half and add some Keto Friendly, Low Carb, Gluten Free Ice Cream to the middle. If you want, you can put it in the freezer for a bit to harden up the sandwich. This entry was posted on February 26, 2017 at 9:33 PM and has received 550 views. There are currently 0 comments. Print this entry. 90 second bread, yep, I said 90 second bread. It comes out to about the size of 2 english muffins that are stacked on top of each other, but this bread is spongy unlike english muffin bread. When in a pinch, this is super easy to make and the uses of this bread are almost endless. This entry was posted on February 26, 2017 at 8:23 PM and has received 1519 views. There are currently 0 comments. Print this entry. What's better than having chocolate and sweets while on a low carb diet. How about french silk pie while on a low carb, keto diet? What if I said that it could be Low Carb, Keto Friendly AND Gluten Free? How about I tell you about this awesome pie, the french silk pie. It has a bit of weight to it and it is sooooo good! Just look how good that is! The taste is out of this world and to have it work on the low carb / keto diet is just amazing. This entry was posted on February 19, 2017 at 4:39 PM and has received 613 views. There are currently 0 comments. Print this entry.